and 24 miles south of Sugarbush, VT.
Take I-93 North to I-89 North, continue North and take Exit 3 (Bethel, VT) to Route 107 West. Follow Route 107 West to Stockbridge, then Rt. 100 N. to White River Golf Club. 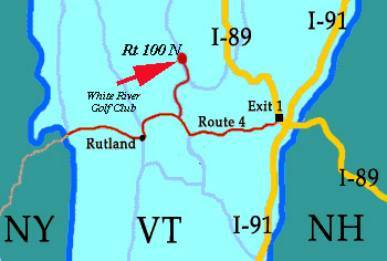 Take I-91 North to I-89 North at White River Juntion, VT.continue North and take Exit 3 (Bethel, VT) to Route 107 West. 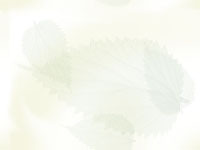 Follow Route 107 West to Stockbridge, then Rt. 100 N. to White River Golf Club. Take I-95 to I-91 in New Haven, CT. Take I-91 North to I-89 North at White River Juntion, VT.continue North and take Exit 3 (Bethel, VT) to Route 107 West. Follow Route 107 West to Stockbridge, then Rt. 100 N. to White River Golf Club. Take the NY Thruway to Exit 24 in Albany. Continue on to I-87 North (the Adirondack Northway) to Exit 20 in Glens Falls/Queensbury. Follow NY 9 North for about 1/2 mile to NY 149 East, and on to Fort Anne, NY. In Fort Anne, turn left onto Route 4 North. When you cross the border into Vermont, it becomes Route 4 East. Continue through the city of Rutland and on to Killington, then Rt. 100 N. to White River Golf Club. Take feeder highways to NJ Turnpike. Exit onto Garden State Parkway and follow to NY Thruway. Follow directions above under "From NY City & NJ". Take 401 East to Montreal and exit onto Highway 10. Exit at Route 133 South and follow to the border crossing at Highgate-Phillipsburg. From Burlington: Take I-89 South to Exit 3 (Bethel, VT). Follow Routes 107 West to Rt. 100 N. to White River Golf Club.